Remember Blake’s 7? The seminal space opera from the 70s was one of the best TV programs at the time. Unlike Star Trek, Blake’s 7 had a lot of grit to balance the camp (and lousy special effects). Anyway, this post isn’t a Blake’s 7 tribute and concerns itself with a homemade knitted blanket featuring the TARDIS phonebooth from Dr. Who. We just mentioned Blake’s 7 cos if the program endured a little longer, it might still have a following these days. Though in the fortunate event that you were in possession of this blanky, wrapping yourself in it won’t take you places. 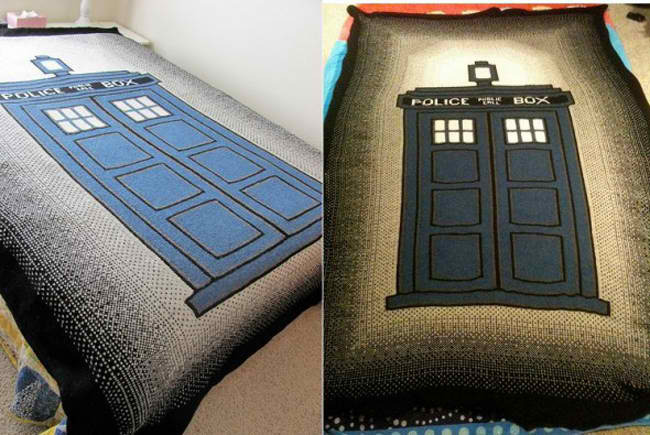 Your dreams might be Dr. Who themed though.